"The current methods of restoring these sites are not as cost efficient or energy efficient as they could be, and can cause more environmental disruption," said Susan Kaminskyj, a professor in the Department of Biology. "Our biotech innovation should help to solve this type of problem faster and with less additional disturbance." Kaminskyj led a research team that included three biology students and a post-doctoral fellow in the U of S College of Arts and Science. Results from their work, funded by the Natural Sciences and Engineering Research Council of Canada, were published in the journal PLOS ONE. About 800 square kilometers of Alberta's Athabasca oilsands are covered in coarse tailings: some of the leftover materials from refining surface-mined bitumen. Contaminated with an oily residue, lacking nutrients and resistant to absorbing water, coarse tailings are a hostile environment to both plants and soil microbes. But after tailings lie exposed for a decade or so, a few weedy plants often manage to take root. One of these, a dandelion, was obtained by the U of S team in 2007 upon being discovered growing naturally on a coarse tailings site. From its roots, former graduate student Xiaohui Bao isolated a unique strain of fungus. The researchers soon found that the fungus—which they named TSTh20-1—has a remarkable property. When its spores are applied to plants, those plants grow and thrive on coarse tailings. "There are lots of micro-organisms out there that eat hydrocarbons for a living. But what is really neat about this one is that it's in symbiosis with a plant," said Tim Repas, one of the paper's authors. "It's not only eating the hydrocarbons, but it's letting the plant survive in these environments." 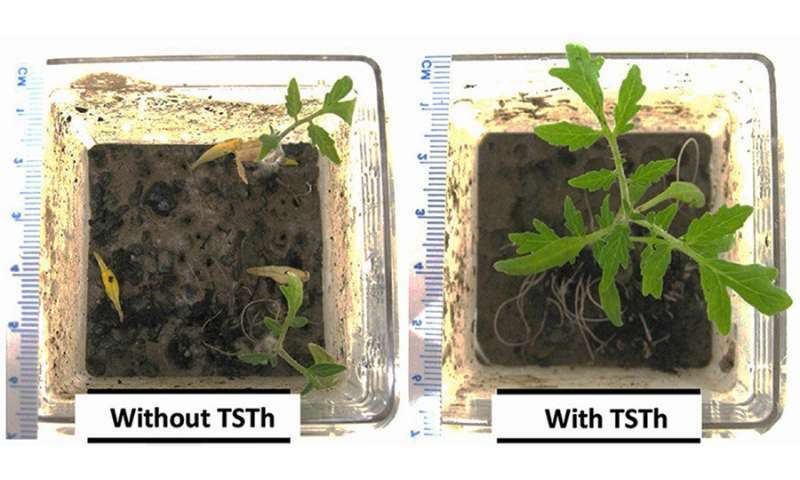 In Kaminskyj's laboratory, more than 90 per cent of seeds treated with TSTh20-1 sprouted on coarse tailings, while none of the untreated seeds sprouted. Tomato seedlings treated with the fungus flourished on tailings even without fertilizer and grew to produce tomatoes. As the plants grew, they also cleaned the soil beneath them. Petrochemical residues in the tailings were broken down, creating a healthier growth environment. The fungus was even able to grow directly on diesel, crude oil and similar materials as its only nutrient source—the first time this ability has been seen in a member of this fast-growing group of fungi. The researchers concluded that TSTh20-1 has excellent potential to restore many types of petrochemical spills as well as coarse tailing sites. Seeing these properties together in one organism is exciting, said Repas, a recent master of science in biology graduate who now works as an environmental scientist. It means the TSTh20-1 fungus is "multitalented." "So we can do the remediation and the reclamation of a site at the same time," Repas said. Ordinarily, remediation—removing contaminants from a site—is done separately from reclamation—restoring the land to near its original state. In the event of a spill, contaminated soil is often scraped up and hauled away in a lengthy and expensive process. New soil is then brought into the area and seeded with native plants. "With our process, they could just lay down our treated seeds and then check on the site every so often," said Kaminskyj. "They could put less energy, more effectively, into a much larger space." The next step is proving the method works in the real world. The team has already started tests at two petrochemical spill sites in Alberta and British Columbia and expects to begin seeing results next year. The researchers are also seeking industry partners who would like to test the process at oilsands tailings sites or at oil spills. Another area of further investigation will be the mechanism by which TSTh20-1 achieves its effects. One clue is the increased levels of enzymes called peroxidases that the team found being secreted by plants colonized by the fungus. "Peroxidases can break down any kind of chemical bond, and they appear to be deeply involved in decontaminating the petrochemical component of tailings," said Kaminskyj. Knowing more about how TSTh20-1 works could help with identifying additional organisms that grant similar benefits to plants. The researchers are currently studying 10 new candidates isolated from plant roots.